SEO is a critical factor for driving traffic to a company’s website. While advertisement campaigns can create brand awareness, nothing compares to the specialization, low cost and results that come from investing time and money into search engine optimization. The internet is a big place and with a little help your company can draws thousands of visitors that are actually looking for your business. Compared to other advertisement methods SEO setup is a relatively cheap alternative. While a paid ad can funnel some traffic to your website and create some business the traffic ends when the ad is pulled. SEO is about growing a trusted brand online and creating loyal customers by making it easier for them to find your business. Websites listed on the first page for a google search receive the majority of impressions, meaning more people visit the sites. Not only do more people click on the websites but specialized meta tags help people that are actually interested in the service or product offered on the website find it. More clicks equals more traffic which means more business and more money. Customers are more likely to trust companies and brands listed on the first page for Google. People trust Google and that gets translated into them trusting your website even if there is no name recognition for the brand. People are more likely to visit a website with a higher listing versus a website that is listed as an advertisement. Investing in SEO is a smart business move. The same dollar amount spent investing in SEO versus a static advertisement returns 2 percent higher sales. Search engine optimization is not only cheaper but more likely to pay for itself. While there are many different ways to measure the success of a website the point is there are ways to do it. 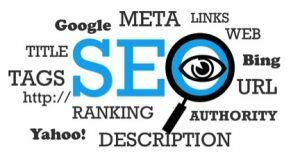 SEO results in quantifiable data that can be measured and viewed to judge the success of a website whether or not it is an e-commerce website. These metrics can these be used to gauge what needs to be changed and how the website can be improved. How’s that billboard looking now? There are over 200 million websites today and it is hard to make your brand stand out without doing so purposefully. That is where SEO comes in. By investing in SEO you can make your brand stand out among a highly competitive field. Inbound marketing like SEO is proven to produce more leads than outbound marketing. Among marketing professionals SEO is the number one source for leads. Remember, if customers can’t find your website they are taking their business to a competitor. Today, companies like Yelp cater to the consumers desire to research a product or service before even leaving their home. If a consumer can’t find your business or product online they are almost guaranteed to not pursue it. Imagine spending a fortune on a great website for your business and having no one view it. This is actually a more common problem than people realize. If no one can find your website it’s almost like not having one at all. SEO resolves this problem and more. SEO takes people that are looking for a specific service or product and directs them to your site.